On Wed 14th November, the school was privileged to host the launch of the new book "Magenta Principles Ireland" by the world leading educationalist Mike Hughes, whose work is at the cutting edge of educational thinking. The Magenta Principles is an approach to teaching based on the premise that learning should be both exciting and engaging. Over the past few years many teachers here at Castlecomer have received training in incorporating these principles into their lessons, and the whole school is benefitting as a result. In this new book there are multile examples of excellent teaching that were contributed to the book by teachers in CCS. 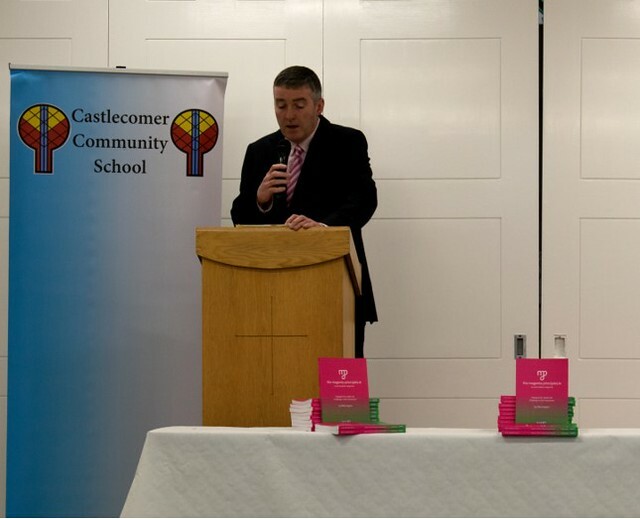 We were delighted to have the author present for the launch, as well as representatives from the NAPD, the County Council, the Board of Management and Parent's Council among others, as well as live broadcasts by KCLR and interviews for the Kilkenny People. The principal Mr. O'Connor then presented Mr. Hughes with a Kilkenny jersey and a hurley signed by Henry Shefflin as a souvenir of his visit to Castlecomer. Click on the photo below to view some photos of the day.